AUDIOCAN3.a, a photo by Crewest on Flickr. Hope you can come down and support our first event of the New Year @ Crewest! It's an all LIVE painting event with great music by DJ Phyz Ed and friends. 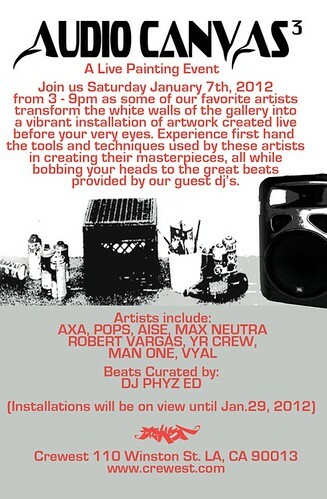 I'll be painting a special installation with local LA artist Robert Vargas. It's the first time we collaborate on some paintings, should be lots of fun. Feel free to stop by anytime from 3 - 9pm and see how we progress throughout the session. Each artist on the lineup is amazing to watch paint live so don't miss out!